This 15 man board, elected and ordained by the church, is charged with general oversight of the spiritual life of the church and assisting the pastor in his duties and related activities, including making recommendations of policy for church approval. -Assisting the pastor in serving communion each month; some members assist in serving communion at local nursing homes regularly. -Maintaining a tape ministry to serve shut-ins and others. -Contributing and collecting offerings for the Benevolent Fund and using funds for needs recognized throughout the year. -Conducting visitations on their own and with the pastor to church members and families as needed. 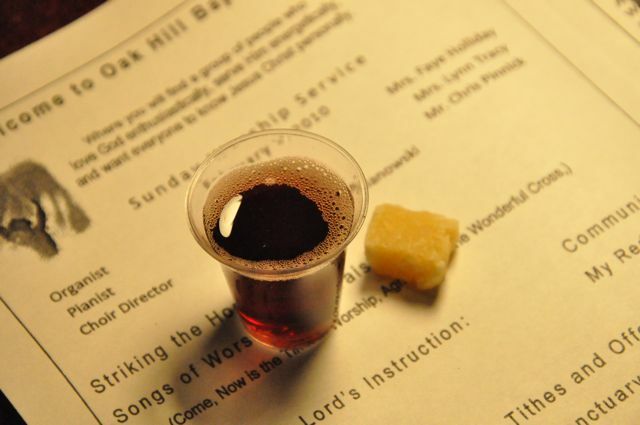 Do you feel that you are qualified, or someone you know is qualified to be a Deacon of Oak Hill Baptist Church? If so, please speak to the individual to be certain they will be willing to be a Deacon. If the individual would be willing, please speak to an active Deacon about nominating that individual to be a Deacon. Please understand that to be nominated does not mean that a man will be elected to be a Deacon. Once the name is submitted the active Deacons and Pastor White will screen it. Upon passing the screening process the name will be put in the pool from which 4 names will be elected to be elected to become Deacons. Length of term is 3 years. A Deacon shall be a member of the church in good standing and at least 21 years of age. A Deacon shall maintain a radiant Christian testimony, which is beyond reproach. A Deacon shall meet the requirements for Deacon as found in I Timothy 3: 1-13. The Board of Deacons shall have a general oversight of the spiritual life of the Church and assist the pastor in the performance of his duties, control the spiritual and moral use of church property, provide Christian instruction and ministry to the church membership. The board of Deacons shall make recommendations of policy for church approval or disapproval.